It’s a common thing that people dream about having a perfect life and the luxury along with a secured job. But fulfilling that dream can be little harder. Nowadays, recruiters prefer candidates with complete experience and skill package. And that is why their interview process comes with some more screening interviews, in other words, most of the interviewers try to add in some of the interview process so that they can recruit the best and qualified employees for their company. The recruitment process takes care of different levels of screening candidates skills and abilities. Therefore, there are certain things that an employer need to keep in mind while recruiting a qualified employee. It is one of the things that should be followed by each and every manager and head of department of the company. Most of the managers have a common attitude towards interviewing process and that is getting it over with as soon as possible. Therefore, managers need to keep in their mind that their time and efforts during the interview process will be appreciated positively, if they try to concentrate more selecting a right candidate than anything else, the manager can get out of that time consuming process. Most of the time during interviewing process, the candidates tend to forget their main skills and talents that is required in that particular job or position. And that is why it is very much important for the candidate as well that he should follow a certain type of protocol. Similarly, this can be applicable for the managers as well, because he need to select a candidate who should avail all the qualities stated in the job description or in the job protocol. It is possible that in the office there will be many of already existing employees who would like to try for the position offered. And that is why the manager need to be fair with everyone when it comes to job or a position. Because of this the manager can increase his chances of hiring qualified employees for the most important job. Therefore, it is necessary for the manager to provide a fair opportunity to all the inside and outside candidates for the post offered. Some of the interview questions asked during the process might not be related to that particular position, but still employers present such questions as all the interview process should follow a certain type of question pattern. Therefore, it is necessary that managers need to understand the value of accurate questions during the interview. If the manager presents a valid question which is related to the job offered, then it definitely shows some sort of sense in their interview process. Sometimes it is possible that the manager might fall for the fake personality of the candidate that he purposely portrayed during the interview. So to avoid that situation the manager need to reassure himself that his decision regarding that particular candidate is the correct one. Therefore, the manager need to be sure of his decision when it comes to selecting the right candidate for the position required by the company. It is quite common that when a company puts up an advertisement in the newspaper or social media, then most of the people attend such interview with the hope that they would get themselves selected. But some candidates miss that opportunity of proving themselves. Therefore, it is necessary for the employer to understand that after selection of the final candidate the manager need to appreciate the rest of the candidates for showing up at the venue and being patient with their interview process schedules. It is a necessary process which requires to be scheduled before the final interview sessions. With this telephone screening process the employers get to know more about the candidate. And it also helps in shortlisting the necessary candidates for the position along with their expected experience and skill. Therefore, these phone screening sessions prevents wastage of time and avoid unnecessary conversation with unrelated candidates. Most of the candidates applied for the post offered definitely apply for the job with relevant experience and skill. So the manager needs to verify those details about experience and skill of the candidate. Once the candidate details are verified then the manager can proceed with the candidate. Therefore, it is quite important that the managers need to be sure of his decision by verifying the details of the candidate. It is essential that like the company checks up all the details about the candidate and asks all sorts of questions with the candidate, then even the candidate has a right to ask few doubts about the job offer. Therefore, while presenting the final job offer the candidate need to determine the value of the candidates experience and skills. Moreover, the candidate needs to make his decision in respect to the offer presented by the company. Some managers gets impressed with the pattern of the resume. Therefore, it is necessary for the candidate that he need to understand the value of the pattern of the resume accordingly. Moreover, it is expected from all of candidate that they need to update their resume patterns accordingly with the time. So that it would be easy for the employer to clear out the necessary details regarding the experience and skill with the rest of the important details about the candidate. 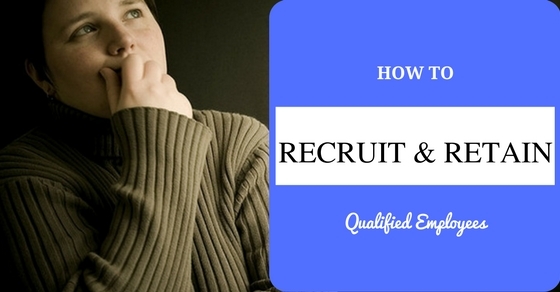 There are several tips that every recruiter needs to follow to know how to retain qualified employees. Moreover, these tips also help to attract more qualified employees for the welfare of the company. It is not easy to retain the qualified employees of the company, it requires a plan that needs to be executed with complete dedication and hard work. And that plan would be as follows. With the help of the training all candidates can prepare themselves for the job they have been selected for. And all selected candidates need to attend that particular training session to complete their knowledge about the position. Therefore, training the candidates not just help the candidate, but actually it also helps the managers and the company so that they hold the needs of the employee or the candidate. Most of the time the company loses their qualified employees just because of their poor scheduling. Therefore, it is necessary for the employers that they need to provide a feasible scheduling for all the employees of the company. This feasible scheduling helps the employers that they actually know the comfort levels of working in the company. Moreover, these comfort levels can be measured in terms of the candidate’s performance in the company. It is one of the professional way of introducing the employee as a part of the company. It is required to be executed for the sake of the employee and the company. Before joining the company the employee need to be completely aware of the company policy and all the company objectives. These company objectives provide necessary information about the company ethics and cultural values. One of the main and most important subject that interests all the candidates applying for the post. The company delivers their final decision by offering the required value of the benefits that the employee would be eligible to receive, if he decides to join the company. Therefore, while providing monetary benefits the employer need to estimate the value for the employee experience and the skill which is essential for the post offered. Other than salary the company offers many other benefits. Moreover, the employee would honor himself with the benefits such as medical benefit, bonus and leave benefits. These benefits will be offered to the employee along with his salary and responsibility towards the company. Therefore, all the managers need to provide these benefits to the employee so that the manager can retain that qualified employee for the sake of the growth of the company. Finally, the bottom line is that during this discussion over the tips to recruit and retain qualified employees, one can definitely understand the value of a qualified candidate or employee for the company. Some of the parts of the discussion even suggests that the recruiter need to change some of his behavior during the interview so that he can choose a qualified candidate for the position and some more tips to retain that particular employee as well.